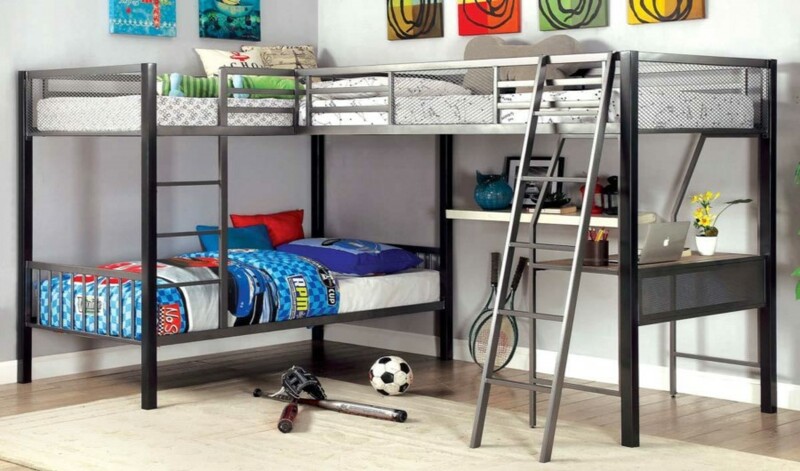 It is true that selecting the best bunk beds for your kids can be a daunting task. Before buying bunk beds, it is very important that you have a clear and better understanding of the safety concerns that are associated with it. • Measure the Space– According to some reports, bunk beds are a natural fit for small spaces however it has lots of benefits for huge rooms. The first thing that you need to consider is to measure the floor space and at the same time determine the height of the ceiling. It is important to leave 2 feet of space between the ceiling and the bunk bed to avoid bumps. The heights of bunk beds vary, but the normal bunk is between 5 and a half to 6six feet tall. • Determine Bunk Bed Type– Today, there are lots of types of bunk beds that you can opt from. Most bunk beds usually fall under the two broad categories such as Lofted and Basic. Lofted beds come normally come with a lofted bed over a sturdy centre and lofted bed over a futon while basic bunk beds are available as a twin over full and twin over twin. Apart from this, there are awesome configurations that usually provide sleeping surfaces. Bunk beds are perfect for three children who share a room or for sleepovers. • Determine you Needed Features– Play features, study areas and special features are just one of the amazing features of bunk beds. Play or storage areas such as tents or slides are widely available, depending on the needs and age of your child. If your child truly loves to invite their friends to sleep over, then bunk beds with pull out or futons are the best choice. It is very important to know and get the opinion of your child regarding this matter before buying bunk beds. • Select the Style– Bunk beds come in different styles that your child can choose from. Aside from this, you also have different choices of materials such as all metal, all wood or combination of both. Since bunk beds come in various styles, you can be sure that you can easily find your desired style that will suit with your taste and needs. • Make Sure that your Chosen Bunk Beds are Safe– It is a fact that bunk bed safety is very important. Before buying bunk beds, it is highly recommended to make sure that your chosen bunk beds have the safety features such as footboards, headboards and guardrails. Parents should also explain to their child that they need to observe proper safety rules when they are using their bunk bed. Hope News promises to bring you the Latest Breaking News & Top Headlines. Local and international news on politics, business, technology, culture. © 2019 - Hope News. All Rights Reserved.